A quick refresher on what “the little girl” actually is. Are we in for snow, or just rain? It seems like every year there’s some talk of El Niño or La Niña, and every year you intend to figure out what that really means. It’s something about the weather getting warmer…right? But only in certain places? Wind is definitely involved, you’re just not 100 percent on the where or how or why. You’ll get around to it one of these years. This year is that year, and today is your lucky day. Buckle up, people, because you are about to finally find out what the heck La Niña is—so you can someday casually drop some knowledge into a conversation as if you’ve known it for years. Also, you’ll understand the weather around you, since 2017-18 is supposed to be a La Niña season. That’s probably more important than your cocktail party conversation game. The Pacific Ocean seems like one giant body of water. And it is! But within that enormous, sloshing mass is quite a lot of variation in temperature. The top level tends to be warmer, since it’s heated by the sun, while the lower bits are increasingly cold. If a strong enough wind blows across the surface, it pushes that warm layer in the same direction—displacing the cold underlayers. You can watch a nice animation of what’s happening here, courtesy of the National Ocean Service. Those winds are called trade winds (they’re consistent and flow in predictable patterns, and so were used by trade ships to sail quickly from one country to another). In the Pacific, close to the equator, the trade winds blow from east to west. Warm waters travel towards the East Indies, and the deep, cold waters near the Americas rise up in their place. 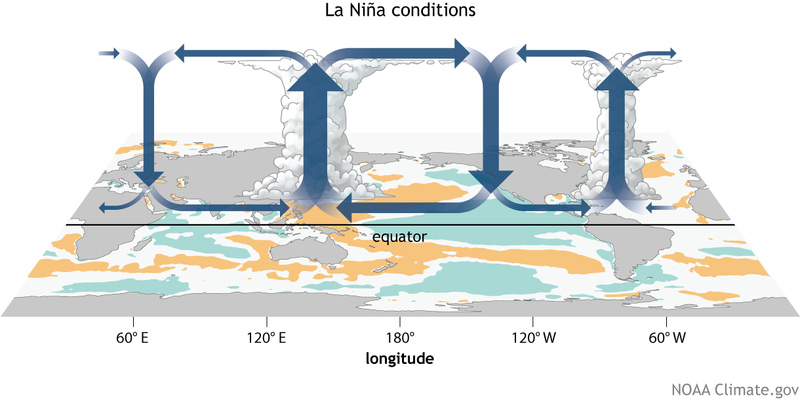 That patch of abnormally cold ocean is what creates La Niña weather, because the surface temperature of a body of water has a big impact on local precipitation. This in turn affects global wind patterns. A weak year, which is what scientists are predicting for the 2017-18 season, means the change in temperature is between 0.5 and 1 degree Celsius below average. A moderate year is between 1 and 1.5 degrees colder, and a strong year is anything greater than that. A cold ocean makes for dry, sinking air. Conversely, a warm ocean makes for moist, rising air that turns into precipitation. That means that in La Niña conditions, precipitation occurs in the East Indies, while our region of the Pacific is cooler and drier. This shift in precipitation causes the polar jet stream to dip down towards the U.S., bringing cold air with it. Northern states will see cooler weather and more rain or snow, depending on how close they are to the edge of the jet stream’s path. And since the Pacific jet stream isn’t as strong, the south tends to be drier and warmer than average. Here comes that pesky forecast uncertainty we know and love. Weather patterns on a global scale are pretty predictable, but the smaller the area you look at, the harder it is to determine the forecast. La Niña patterns will mostly hold true year to year, but the exact precipitation distribution can vary quite a bit. Check out this comparison of La Niña years from the National Oceanic and Atmospheric Administration: It’s ranked by how strong the effects were, and you can see that even within strong or weak types, the inches of precipitation aren’t super consistent. In 2005-06, the Pacific Northwest saw a ton of rain. Just a few years later in 2008-09, they’d see far less than normal. Both years were weak La Niña patterns. That’s because there are just too many other weather phenomena that affect our winters. The variation in pressure over the Arctic and the Tropics plays a significant role in determining wind flow and temperature, for example, and then there’s always some randomness to make meteorologists’ jobs even more difficult. NOAA scientists are predicting that a La Niña will form, but we’re not there yet. Right now, they’re saying there’s a 55-65 percent chance. For it to officially be a La Niña year, the sea surface temperature needs to hold at least 0.5 degrees below average for three months. September looked to be cooler than normal, but in the last half of the month the ocean temperature went back up a bit. So even though the wind and cloud patterns look La Niña-esque, NOAA hasn’t yet declared it so. There will be a further update coming from NOAA this week, so stay tuned for more detailed information on whether you’re likely to get a ton of snow days—or just a lot of rain.